One of the most important theorems in 3-manifolds topology is Agol’s Theorem asserting that every closed 3-manifold is virtually fibered and in particular virtually Haken. Agol proved this theorem in early 2012 for closed hyperbolic manifolds. The general (closed) case reduces to hyperbolic manifolds via geometrization. A new paper on the ArXiv gives a new proof of virtual fibering for cusped hyperbolic manifolds. This criterion is from Agol’s proof known to be satisfied for closed manifolds and the authors use Dehn fillings to reduce the cusped case to the closed one. The main technical result that they prove for this purpose is a certain “wideness” condition for Dehn fillings. 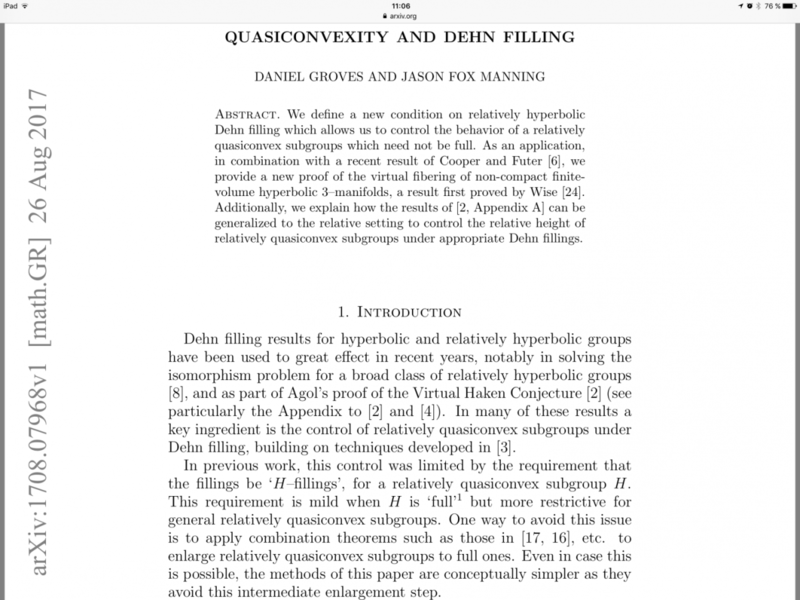 Namely, for a relatively quasiconvex subgroup \(H\) in a relatively hyperbolic group $G$ they call a normal subgroup $N$ (along which the Dehn filling is performed) to be \((H, S)\)-wide for a finite set \(S\subset G\) if, whenever there are \(h\in H,s\in S\) such that \(hs\in N\), then \(s\in H\). Their main technical results are then certain existence results for \(H\)-wide fillings. For example they show the following result: Suppose that \(P\) is a group and \(B\) is a separable subgroup. For any finite set \(S\) there exists a finite-Index normal subgroup \(K_S\subset P\) so that for any normal subgroup \(N\subset P\) with \(N\subset K_S\), the subgroup \(N\) is \((B,S)\)-wide in \(P\).